There aren’t a lot of updates this week on the house. We did decide to change the floor plan slightly which is much more functional and flows better with our furniture. I really hope we can secure a building contract soon…..FINGERS CROSSED! Now I know why some people prefer to walk into a model home center and pick out a pre-designed house. It’s just easier! But, I won’t do that. I have designed this house in my head for years. I know what I want and although I will be sacrificing on many things, I must keep going. As the builder puts together a contract for us, he wants to know about things that we want in the home like metal roof vs shingle, or granite vs quartz, or …..TILE VS VINYL? And that’s what we will talk about today, FLOORING! The new HOT product in the design world is LUXURY VINYL PLANK (LVP). Some call it LUXURY VINYL TILE (LVT) but either way it’s the fastest growing thing in the flooring industry. Check out the many reasons why we are considering this for our new home. The idea is that these are designed to look and feel like real hardwoods. It’s engineered to show texture and and character. Most people would not guess that these aren’t real! This goes perfectly with any decor including my farmhouse style. Don’t you find the look of wood so warm and inviting? The good news? You can install this stuff OVER most existing floors. Just make sure your area is smooth. Now for the easy part….THEY SNAP TOGETHER! Most people are able to complete a big space in a small amount of time. We started searching for other flooring options when we were budgeting the cost of our new home build. Flooring is expensive y’all! 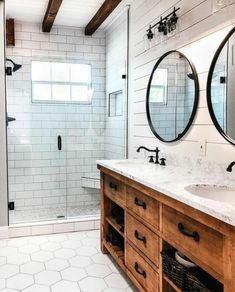 Although we enjoy the wood-looking tile that we currently have in our home, it would be very expensive to use this in our new place. We were introduced to this vinyl plank idea after hearing about it from other decor enthusiasts. We have kids and a dog. That’s it. That’s all I need to say. My friends that have used luxury vinyl plank tell me this stuff is tough as nails. And in our home it has to be! We’ve got 3 kids and a dog mess-makers and we actually want to LIVE in our house! We do not want something that we are scared to use. Many manufacturers sell it as scratch resistant, water resistant, and some go as far as saying water proof. Most are engineered to have a real wood texture, so if you do accidently put a scratch or mark in it…..who cares? You won’t notice. This makes it a great choice for high traffic areas such as kitchens, bathrooms, and laundry rooms. I mean those are some big claims that this family of 5 could put to the test in just a few short minutes! Love and Renovations gives a great review here! First off, I have to say things like “be sure to read the manufacturer’s instructions on how to care for the particular flooring you have purchased”. Each brand may offer different care instructions so please read them! Now that you’ve learned WHY you should choose this flooring, you’re probably wondering which brand to buy. Check out this great article from The Spruce for a great comparison of the options. Do you have luxury vinyl plank in your home? Did you install it yourself? Is it everything you hoped it would be? Is this it? Final Floor Plan! WE BOUGHT A MINI FARM! Hi there! I’m Christy and welcome to Designing The Days. My family and I are building a new home on 5 acres of land in sunny South Florida. Grab a cup of coffee and join us on our coastal farmhouse build. We will chat about decor, DIY, and yummy food! 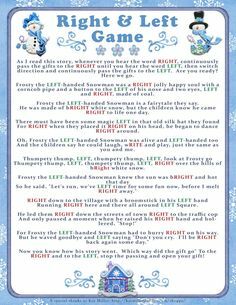 EVGENIA GL CHRISTMAS GIFT Love this fun twist on traditional gift exchange games! Free printable cards inspired by the 12 days of Christmas to use for swapping gift exchange gifts and some even some fun gift ideas if you need some ideas. 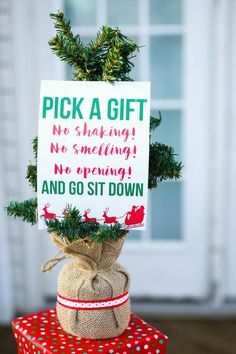 Make this year's gift exchange the best of all with these seven great tips and the free printable gift exchange game idea!